WallaMe is kind of a messaging app. But it’s kind of not. It’s mostly a game with some possible extra fun for those who enjoy photo editing. You start by taking a picture of something large and static, like a wall or billboard. You then edit the image with the editing capabilities in the app; users can include stickers, images from the phone’s gallery, text, or simply draw freehand over the picture they’ve taken. So now you have a picture with a message / another image / sketch superimposed on it. Once you’re done editing the picture, you choose whether anyone on the app can view the edited image, or just some of your friends, or just someone in particular. Here’s the fun part though: WallaMe doesn’t just let people view the edited image anywhere (in which case it would be just another photo sharing app). 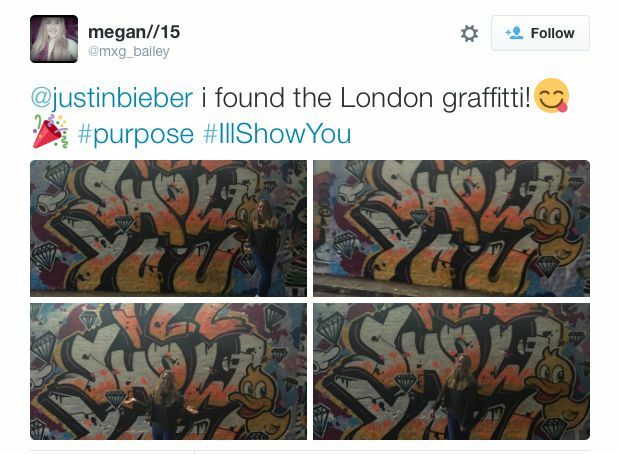 Instead, it reveals it to them when they go to the exact spot where the original picture was taken and hold the phone’s camera over the surface on which the message was superimposed. Essentially, the app uses augmented reality to let users hide messages in plain sight. The digital geocaching game isn’t the only feature the app offers. The home page of the app is a stream of pictures (including the edits) taken by users sorted by popularity and recency; you can like and comment on these images. There’s also a “Walls Map” page, where you can view messages users have left at various spots on a world map and enabled for public viewing. This functionality is a bit counter-intuitive to the basic premise of the app, as it only lets people view public “secret” messages if they’re not in close proximity to where the picture was taken; if a user is “close” to a public message, the app hides the message from them until they physically go to the precise spot of the photo and reveal the message via augmented reality experience. 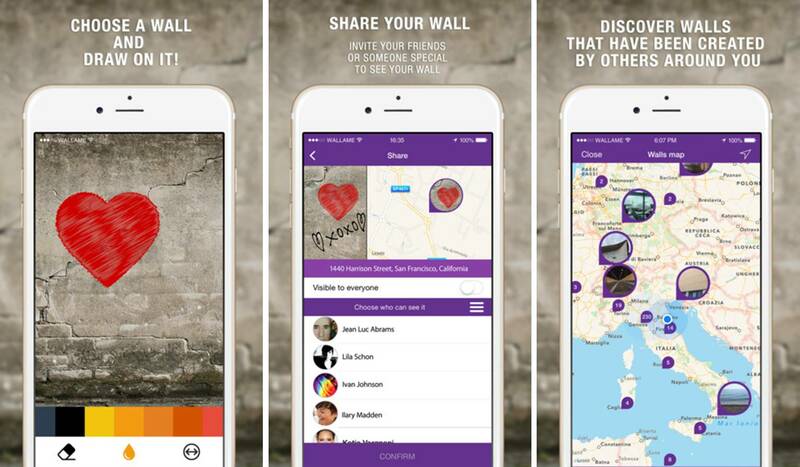 The photo stream brings social media-like capabilities to WallaMe, but it ends up being a bit of a distraction from its core value, which is hiding messages for your friends to find. The editing features on the app are also pretty basic, so going through pictures of walls that random people have garnished with text or clipart isn’t particularly exciting. While individuals may use the app to organize scavenger hunts among friends or surprise a significant other with a romantic message, WallaMe is also well poised to attract businesses. Foreseeably, brands may organize marketing campaigns offering perks for finding secret messages they’ve left on walls around town using WallaMe. Snapchat’s geofilters – special overlays for Snaps which only appear in certain locations – are similar to what WallaMe offers. However geofilters are uploaded by users and Snapchat requires them to be “original artwork,” so it doesn’t just let people leave messages around in the same way that WallaMe does. An app that can be considered a WallaMe rival is ARoglyph. It offers the same basic features as WallaMe, but focuses a lot more on businesses and communities. DropMessages, an iOS app, also comes close; it lets users leave text messages for contacts at specific locations, so you could use it to remind your friend to pick up sodas while they’re at the grocery store or welcome an associate into town when they land at the airport. Justin Bieber actually organized a scavenger hunt using Drop Messages, helping the app onboard a huge number of users. And that’s the problem WallaMe is faced with at the moment: finding users. Going through my contact list after editing an image, I’m notified that none of them is a WallaMe user. This means that I’d have to shill the app to friends until they’re convinced installing it and sparing the 67 Mb that it occupies is worth the effort. As cool as it seems, WallaMe may have to find a pop star to market an album using it before regular users like me can begin finding use for it. This is awesome! I have never heard of any of these apps and they seem like a good time! Leaving secret messages around town, who knows what fun you would have with a scavenger hunt like the Biebs did. As with many new apps, they are only as good as the people that are using them (including your friends). Otherwise, you become an unpaid salesman for the app and getting people, even those you know, to download ANOTHER app, is not easy.